The Department of World Languages and Cultures would like to welcome you to Chapman University. Whether you are considering a career in law, international business, government, film, public relations, advertising, health care, journalism, teaching... etc., we would like to suggest that a major/double major or minor in a world language will positively enhance your career options when you graduate. Across the country thousands of students apply for admission to graduate school and there is perhaps no better way of catching the eye of graduate admission counselors than doing a major/double-major or minor in a world language. The Department of World Languages and Cultures at Chapman University offers a major and a minor in both French and Spanish and a minor in German, Japanese and Italian. Language majors and minors can also take advantage of a rich array of study abroad opportunities with semester and year-long programs at prestigious universities of higher education around the world. Our study abroad programs provide students with exciting professional opportunities such as the internship program at the world renowned International Cannes Film Festival. Future employers look favorably upon prospective applicants with a language major or minor because they are the best prepared to enter an ever increasing global work force. The Department of World Languages and Cultures at Chapman University prides itself upon the outstanding, individualized educational experience it brings to its students. Before spending a semester abroad, you will meet with your faculty advisor in languages to select courses and to ensure that courses transfer back to Chapman so that you can fulfill not only courses required for your language major/minor, but also many general education requirements. Our majors/minors and students have gone on to various careers/graduate studies which range from Tulane University Law School, University of Wisconsin-Madison, Middlebury College School in Paris, France to Disneyland Tokyo. It is essential that you enroll in a language class as of your first semester of registration so that you may be properly prepared for a fruitful study abroad experience during the fall or spring of your junior/sophomore year or so that you may complete the required courses for the major/minor on the Orange campus. Please give us a call at 714-997-6843 or stop by to see us at any time. We would be happy to set you up with a faculty advisor and plan out your courses and future career. + - Want To Study Abroad? 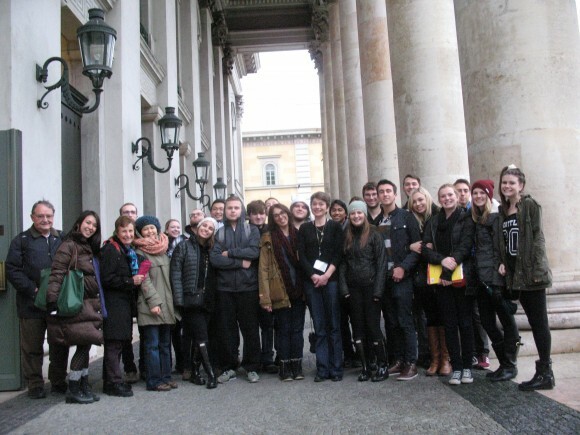 Language Majors and Minors are encouraged to consider the wide variety of opportunities for Study Abroad including the Costa Rica January Study Trip, a semester abroad in France or Germany and a summer travel course to Munich, Germany. We recommend those programs which offer the home stay option so that students maximize their potential for truly experiencing the language and culture of a different country. The Department of World Languages and Cultures is committed to providing students with ample opportunities to explore their identity as global citizens.